Another great year gone by …”The Interior Lifestyle Awards” has become even bigger and better. It was so difficult to choose the semi finalists earlier on & now amongst them to choose just 2 for the finals . An extremely challenging task! Congratulations to Jaya Kanwar in the Textile category and Hitesh Sharma & Pravinsinh Solanki in the home decor category to be the winners! An amazingly creative display of talent by each individual participant on the theme My Heritage… My New India. Each participant is actually a Winner! The GDA is proud to be associated with these very talented young Designers from India we are sure will make a mark in the International Design world. ! The winners are taken free of cost to Frankfurt to showcase their talent at Ambiente and Heimtextil 2019. Shri Ajay Tamta – Hon’ble Minister of State for Textiles, Government of India. semi finalist – Padmaraj Kehri explaining his concept using Coconut and coir as material. Semi-Finalist – Srishti Dube – explaining her concept and interpretation of My Heritage … My India with the use of Borosilicate Glass & Terracotta to the Jury. 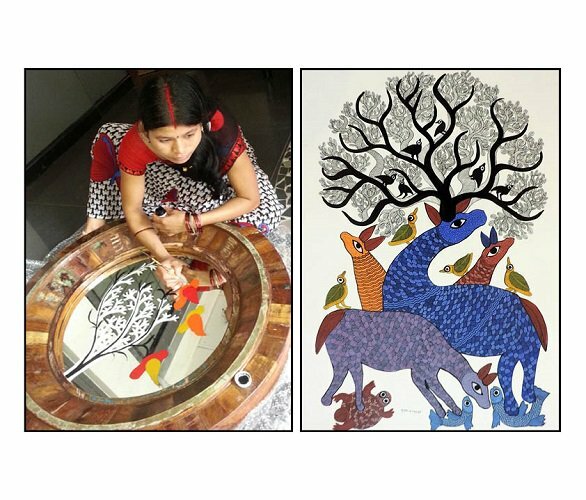 Semi Finalist Sandeep Paul showcasing his same heritage rangoli pattern on stone glass , wood & metal.